Curmudgeonry: Can I Take a Break Now? Things have been slow on the blog, because in real life things have been anything but slow. The kids continue to be kids. The Boy needs to be educated. The packing isn't going fast enough. The other house is a wreck. Laundry piles up and I discovered that I packed my Birkenstocks and most of our summer clothes in some inaccessible location, thinking we'd be moved by now. 6:45 Wake up exhausted and sore from moving boxes, unplanting and replanting. Wish someone would tell you to stay in bed all day. 7:00 Actually drag yourself out of bed. Turn on the kettle and wish you could sit still and enjoy a nice cup of tea. When tea is steeped, drink it while making breakfast and unloading the dishwasher with help from husband who is also corralling children. 8:00 Clean off breakfast dishes, rush self and children into clothing. Gather up swimming paraphernalia, library books. 8:35 Leave for swimming class at the Y. 9:00 Run into swimming class, just on time. 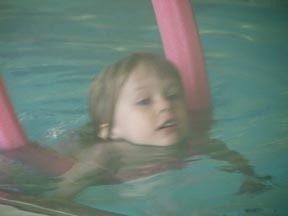 Watch swimming and hope that the four year old doesn't cry. 9:30 Help the four year shower, trying not to get too soaked while turning the faucet on and off. 9:45 After having gotten the four year old showered, dried, and dressed while chasing the two year old and holding the baby in a sling, wait for the seven year old to finish his shower and wonder if he'd been abducted. 10:00 The seven year old finally comes strolling out of the locker room, just as you were about to barge into the men's room and attack the bad guys who must have taken him, since he couldn't possibly take that long when you told him to hurry up with his shower this time. 10:05 Wrestle all small people into carseats. Drive down the street to the library. 10:10 At the library pick out way too many books. Haul them in the double stroller and wonder why they couldn't have shopping carts for book carrying. Suggest the librarian bring it up at the next staff meeting. Notice that nobody else seems to leave the library with 100 books. 10:47 Leave the library and pick up husband down the street and drive to the Purple House to meet with contractor of the day at 11 (the tile guy this time). 11:00 Talk about tile, show him what we want where and let the man take measurements. Clean up after previous contractors, while doing this. Water plants so that things you've transplanted don't die. 12:00 Return husband to his office. Think it is finally time to go home. Realize that you can't after all, because something special is happening this afternoon. 12:30 Arrive at very busy mall and circle the parking lot until you can find a space not on the opposite side of the mall from the bookstore. 1:00 Buy book for seven year old for book signing purposes. Wonder why you didn't buy the book two weeks ago when you were in the store. Now you are down at number 250 in line. Take four children out to lunch at bookstore cafe. Get complimented by waitress for being polite and stowing behemoth stroller under the table. 1:45 Tired, unnapped children behave so remarkably well at lunch that you reward them all with cookies (and yourself -- you didn't even yell at them, after all). 1:46 The book signing doesn't start until 2:00, but already there is no way to get close to the front on the area where the author will be talking. 2:00 Listen to one of seven year old's favorite authors. She seems so nice, you decide that she's your favorite author too. 2:15 Wander the store waiting for your turn in line. 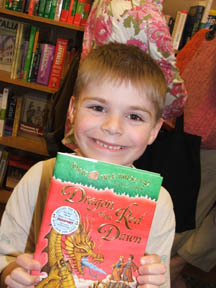 Let four year old pick out cheap paperback book for author to sign too. 2:45 Still waiting. Two year old breaks glass candle holder. Why do they sell those in a book store? 3:30 It's our turn to get in line. Resist the urge to throttle kids who cut in front of you to get the covers of their books signed after the insides already have been. 3:45 Pay for paperback you let your daughter get signed. 7:00 Help get kids into bed. 8:00 Pack things. Goof off on the computer once in a while. Talk to husband. 11:00 Go to bed. Try to read. Realize your brain doesn't work any more. But the day was good and at least one child is very, very happy. 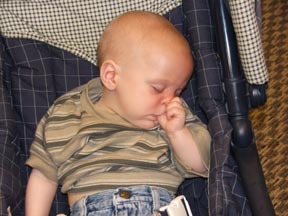 And, at least one got a nap. Good nite, girl! That's a lot to juggle. We saw her at our library this summer! It was so fun! 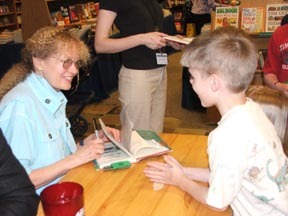 Magic Tree House books rule. The "research" books are a particular favorite of Mr. Skinny (age 8). Sleeping baby is so sweet =] I'm used to being able to skip Special Days. Of course, the 2-yr-old wouldn't know if he missed a Special Day. I guess I'll have to learn to persevere before he turns seven! You are amazing. I am amazed. What do you mean everyone doesn't leave the library with 100 books? I hate to tell you, but as the kids get older, the books get bigger. Buy a back brace.